* It may vary, subject to the daily currency rate applied at the time of purchase. Due to technical issues of the website, the submission deadline is extended to Oct 18 23:59 UTC. There is a limited number of travel grant provided by the IAU to support whom only limited means of support are available, e.g., colleagues from economically less privileged countries and young scientists/professional communicators. Please download and complete the IAU Grant Application Form at https://www.iau.org/static/meetings/GrantSymposium.pdf and please fill “CAP 2018” in the meeting number field. Application deadline: September 15, 2017 23:59 UTC. Communicating Astronomy with the Public 2018 (CAP 2018) in Japan will provide a unique opportunity to promote the development and professionalization of science communication in the Asia-Pacific region. A joint effort between the National Astronomical Observatory of Japan (NAOJ) and a Japanese crowdfunding campaign will allow support for the attendance of participants from developing countries in the region. The application is open not only students and young communicators but to all science professionals whose work can impact the future of Astronomy dissemination and informal outreach in the region. The organizers are paying particular attention to science communicators in developing countries the Asia-Pacific region. The NAOJ and crowdfunding donors will seek to award grants to next generation of science communicators and provide an opportunity for training to all grant allocated participants. 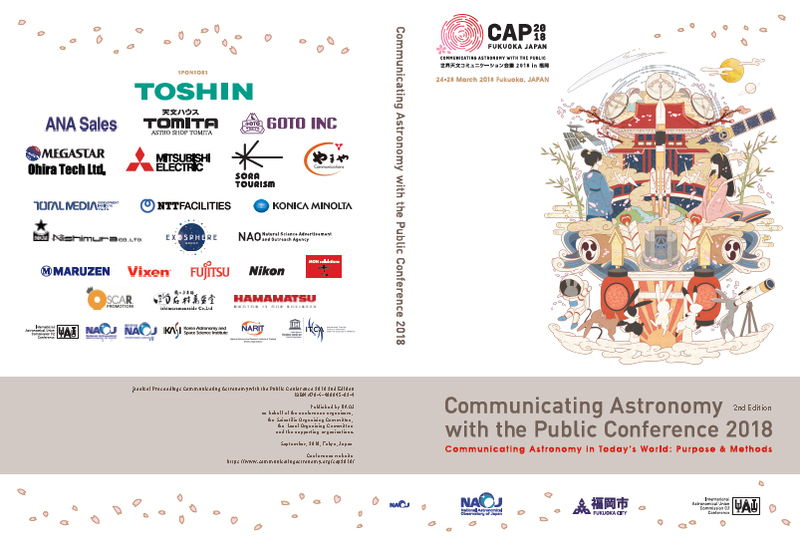 – Send a Motivation Letter (up to 600 words) – that must include (if existing) current activities related to science communication and informal education efforts by the participant, and the importance of attending CAP 2018. – Send your Curriculum Vitae. – Awarded participants will need to attend the full (5 days) conference and are required to participate in designated sessions. – Awarded participants will need to submit a contribution to CAP 2018 – LINK. If necessary, support from the Organization will be provided. – Each awarded participant will be supported with the amount of 800 USD (approximate value, it may vary, subject to the daily currency rate applied at the time of the conference) . – If the participant is a student, a recommendation letter from the Dean/Director of the University is necessary. All accepted contributions for the proceedings should be submitted until two weeks after the end of the conference, by Tuesday, May 15, 2018. All contributions received after the deadline will not be included in the printed version of the proceedings. Authors are asked to prepare their papers using Microsoft Word (or other compatible word processors), according to the guidelines and templates. It is important to ensure that when you submit your paper, it is in its final form ready for publication. CAP 2018 does not provide language editing services. CAP 2018 will light-edit the papers for style and length and will send out author proofs prior to publication. 4) All pictures should be included in the body text. 5) The sample text in the template file includes further instructions for preparing your manuscript. 6) If you have any questions about these guidelines or preparing your manuscript, please contact proceedings-cap2018@prcml.mtk.nao.ac.jp. Manuscripts, prepared according to these Submission Guidelines are expected to be sent to the Editor-in-Chief by May 15, 2018. The proceedings will appear in the printed version (shipped to five-day Registration participants) The proceedings will be available for download online (all papers upon publication will be free to download). Authors are solely responsible for ensuring copyright clearance to reproduce illustrations, text, etc., for which they themselves do not own the copyright. The Editorial team reserves the right of rejecting any submissions that are deemed in insufficient non-compliance to these Submission Guidelines. Users have the right to read, download, copy, distribute, print, search, or link to the full texts of the articles published in CAP 2018 Proceedings.